These highlights do not include all the information needed to use RECLAST safely and effectively. See full prescribing information for RECLAST. The most common adverse reactions (greater than 10%) were pyrexia, myalgia, headache, arthralgia, pain in extremity (6.1). Other important adverse reactions were flu-like illness, nausea, vomiting, diarrhea (6.2), and eye inflammation (6.1). Reclast is indicated for treatment of osteoporosis in postmenopausal women. In postmenopausal women with osteoporosis, diagnosed by bone mineral density (BMD) or prevalent vertebral fracture, Reclast reduces the incidence of fractures (hip, vertebral and non-vertebral osteoporosis-related fractures). In patients at high risk of fracture, defined as a recent low-trauma hip fracture, Reclast reduces the incidence of new clinical fractures [see Clinical Studies (14.1)]. Reclast is indicated for prevention of osteoporosis in postmenopausal women [see Clinical Studies (14.2)]. Reclast is indicated for treatment to increase bone mass in men with osteoporosis [see Clinical Studies (14.3)]. Reclast is indicated for the treatment and prevention of glucocorticoid-induced osteoporosis in men and women who are either initiating or continuing systemic glucocorticoids in a daily dosage equivalent to 7.5 mg or greater of prednisone and who are expected to remain on glucocorticoids for at least 12 months [see Clinical Studies (14.4)]. Reclast is indicated for treatment of Paget's disease of bone in men and women. Treatment is indicated in patients with Paget’s disease of bone with elevations in serum alkaline phosphatase of two times or higher than the upper limit of the age-specific normal reference range, or those who are symptomatic, or those at risk for complications from their disease [see Clinical Studies (14.5)]. The safety and effectiveness of Reclast for the treatment of osteoporosis is based on clinical data of three years duration. The optimal duration of use has not been determined. All patients on bisphosphonate therapy should have the need for continued therapy re-evaluated on a periodic basis. Patients at low-risk for fracture should be considered for drug discontinuation after 3 to 5 years of use. Patients who discontinue therapy should have their risk for fracture re-evaluated periodically. Reclast injection must be administered as an intravenous infusion over no less than 15 minutes. Patients must be appropriately hydrated prior to administration of Reclast [see Warnings and Precautions (5.3)]. Intravenous infusion should be followed by a 10 mL normal saline flush of the intravenous line. Administration of acetaminophen following Reclast administration may reduce the incidence of acute-phase reaction symptoms. The recommended regimen is a 5 mg infusion once a year given intravenously over no less than 15 minutes. The recommended regimen is a 5 mg infusion given once every 2 years intravenously over no less than 15 minutes. After a single treatment with Reclast in Paget’s disease an extended remission period is observed. Specific re-treatment data are not available. However, re-treatment with Reclast may be considered in patients who have relapsed, based on increases in serum alkaline phosphatase, or in those patients who failed to achieve normalization of their serum alkaline phosphatase, or in those patients with symptoms, as dictated by medical practice. Prior to administration of each dose of Reclast, obtain a serum creatinine and creatinine clearance should be calculated based on actual body weight using Cockcroft-Gault formula before each Reclast dose. Reclast is contraindicated in patients with creatinine clearance less than 35 mL/min and in those with evidence of acute renal impairment. A 5 mg dose of Reclast administered intravenously is recommended for patients with creatinine clearance greater than or equal to 35 mL/min. There are no safety or efficacy data to support the adjustment of the Reclast dose based on baseline renal function. Therefore, no dose adjustment is required in patients with CrCl greater than or equal to 35 mL/min [see Contraindications (4), Warnings and Precautions (5.3)]. A routine oral examination should be performed by the prescriber prior to initiation of Reclast treatment [see Warnings and Precautions (5.4)]. Instruct patients being treated for Paget’s disease of bone on the importance of calcium and vitamin D supplementation in maintaining serum calcium levels, and on the symptoms of hypocalcemia. All patients should take 1500 mg elemental calcium daily in divided doses (750 mg two times a day, or 500 mg three times a day) and 800 international units vitamin D daily, particularly in the 2 weeks following Reclast administration [see Warnings and Precautions (5.2)]. Instruct patients being treated for osteoporosis to take supplemental calcium and vitamin D if their dietary intake is inadequate. An average of at least 1200 mg calcium and 800-1000 international units vitamin D daily is recommended. The Reclast infusion time must not be less than 15 minutes given over a constant infusion rate. Reclast solution for infusion must not be allowed to come in contact with any calcium or other divalent cation-containing solutions, and should be administered as a single intravenous solution through a separate vented infusion line. If refrigerated, allow the refrigerated solution to reach room temperature before administration. After opening, the solution is stable for 24 hours at 2°C-8°C (36°F-46°F) [see How Supplied/Storage and Handling (16)]. 5 mg in a 100 mL ready to infuse solution. Creatinine clearance less than 35 mL/min and in those with evidence of acute renal impairment due to an increased risk of renal failure [see Warnings and Precautions (5.3)]. Known hypersensitivity to zoledronic acid or any components of Reclast. Hypersensitivity reactions including urticaria, angioedema, and anaphylactic reaction/shock have been reported [see Adverse Reactions (6.2)]. Reclast contains the same active ingredient found in Zometa, used for oncology indications, and a patient being treated with Zometa should not be treated with Reclast. Pre-existing hypocalcemia and disturbances of mineral metabolism (e.g., hypoparathyroidism, thyroid surgery, parathyroid surgery; malabsorption syndromes, excision of small intestine) must be effectively treated before initiating therapy with Reclast. Clinical monitoring of calcium and mineral levels (phosphorus and magnesium) is highly recommended for these patients [see Contraindications (4)]. Hypocalcemia following Reclast administration is a significant risk in Paget’s disease. All patients should be instructed about the symptoms of hypocalcemia and the importance of calcium and vitamin D supplementation in maintaining serum calcium levels [see Dosage and Administration (2.8), Adverse Reactions (6.1), Patient Counseling Information (17)]. All osteoporosis patients should be instructed on the importance of calcium and vitamin D supplementation in maintaining serum calcium levels [see Dosage and Administration (2.8), Adverse Reactions (6.1), Patient Counseling Information (17)]. A single dose of Reclast should not exceed 5 mg and the duration of infusion should be no less than 15 minutes [see Dosage and Administration (2)]. Reclast is contraindicated in patients with creatinine clearance less than 35 mL/min and in those with evidence of acute renal impairment [see Contraindications (4)]. If history or physical signs suggest dehydration, Reclast therapy should be withheld until normovolemic status has been achieved [see Adverse Reactions (6.2)]. Reclast should be used with caution in patients with chronic renal impairment. Acute renal impairment, including renal failure, has been observed following the administration of zoledronic acid, especially in patients with pre-existing renal compromise, advanced age, concomitant nephrotoxic medications, concomitant diuretic therapy, or severe dehydration occurring before or after Reclast administration. Acute renal failure (ARF) has been observed in patients after a single administration. Rare reports of hospitalization and/or dialysis or fatal outcome occurred in patients with underlying moderate to severe renal impairment or with any of the risk factors described in this section [see Adverse Reactions (6.2)]. Renal impairment may lead to increased exposure of concomitant medications and/or their metabolites that are primarily renally excreted [see Drug Interactions (7.4)]. Creatinine clearance should be calculated based on actual body weight using Cockcroft-Gault formula before each Reclast dose. Transient increase in serum creatinine may be greater in patients with impaired renal function; interim monitoring of creatinine clearance should be performed in at-risk patients. Elderly patients and those receiving diuretic therapy are at increased risk of acute renal failure. These patients should have their fluid status assessed and be appropriately hydrated prior to administration of Reclast. Reclast should be used with caution with other nephrotoxic drugs [see Drug Interactions (7.3)]. Consider monitoring creatinine clearance in patients at-risk for ARF who are taking concomitant medications that are primarily excreted by the kidney [see Drug Interactions (7.4)]. Osteonecrosis of the jaw (ONJ) has been reported in patients treated with bisphosphonates, including zoledronic acid. Most cases have been in cancer patients treated with intravenous bisphosphonates undergoing dental procedures. Some cases have occurred in patients with postmenopausal osteoporosis treated with either oral or intravenous bisphosphonates. A routine oral examination should be performed by the prescriber prior to initiation of bisphosphonate treatment. A dental examination with appropriate preventive dentistry should be considered prior to treatment with bisphosphonates in patients with a history of concomitant risk factors (e.g., cancer, chemotherapy, angiogenesis inhibitors, radiotherapy, corticosteroids, poor oral hygiene, pre-existing dental disease or infection, anemia, coagulopathy). The risk of ONJ may increase with duration of exposure to bisphosphonates. Concomitant administration of drugs associated with ONJ may increase the risk of developing ONJ. While on treatment, patients with concomitant risk factors should avoid invasive dental procedures if possible. For patients who develop ONJ while on bisphosphonate therapy, dental surgery may exacerbate the condition. For patients requiring dental procedures, there are no data available to suggest whether discontinuation of bisphosphonate treatment reduces the risk of ONJ. The clinical judgment of the treating physician should guide the management plan of each patient based on individual benefit/risk assessment [see Adverse Reactions (6.1)]. Any patient with a history of bisphosphonate exposure who presents with thigh or groin pain should be suspected of having an atypical fracture and should be evaluated to rule out an incomplete femur fracture. Patients presenting with an atypical femur fracture should also be assessed for symptoms and signs of fracture in the contralateral limb. Interruption of bisphosphonate therapy should be considered, pending a risk/benefit assessment, on an individual basis. RECLAST SHOULD NOT BE USED DURING PREGNANCY. Reclast may cause fetal harm when administered to a pregnant woman. If the patient becomes pregnant while taking this drug, the patient should be apprised of the potential harm to the fetus. Women of childbearing potential should be advised to avoid becoming pregnant while on Reclast therapy [see Use in Specific Populations (8.1)]. In post-marketing experience, severe and occasionally incapacitating bone, joint, and/or muscle pain have been infrequently reported in patients taking bisphosphonates, including Reclast. The time to onset of symptoms varied from one day to several months after starting the drug. Consider withholding future Reclast treatment if severe symptoms develop. Most patients had relief of symptoms after stopping. A subset had recurrence of symptoms when rechallenged with the same drug or another bisphosphonate [see Adverse Reactions (6.2)]. While not observed in clinical trials with Reclast, there have been reports of bronchoconstriction in aspirin-sensitive patients receiving bisphosphonates. Use Reclast with caution in aspirin-sensitive patients. The safety of Reclast in the treatment of postmenopausal osteoporosis was assessed in Study 1, a large, randomized, double-blind, placebo-controlled, multinational study of 7736 postmenopausal women aged 65 to 89 years with osteoporosis, diagnosed by bone mineral density or the presence of a prevalent vertebral fracture. The duration of the trial was three years with 3862 patients exposed to Reclast and 3852 patients exposed to placebo administered once annually as a single 5 mg dose in 100 mL solution infused over at least 15 minutes, for a total of three doses. All women received 1000 to 1500 mg of elemental calcium plus 400 to 1200 international units of vitamin D supplementation per day. The incidence of all-cause mortality was similar between groups: 3.4% in the Reclast group and 2.9% in the placebo group. The incidence of serious adverse events was 29.2% in the Reclast group and 30.1% in the placebo group. The percentage of patients who withdrew from the study due to adverse events was 5.4% and 4.8% for the Reclast and placebo groups, respectively. The safety of Reclast in the treatment of osteoporosis patients with a recent (within 90 days) low-trauma hip fracture was assessed in Study 2, a randomized, double-blind, placebo-controlled, multinational endpoint-driven study of 2127 men and women aged 50 to 95 years; 1065 patients were randomized to Reclast and 1062 patients were randomized to placebo. Reclast was administered once annually as a single 5 mg dose in 100 mL solution infused over at least 15 minutes. The study continued until at least 211 patients had a confirmed clinical fracture in the study population who were followed for an average of approximately 2 years on study drug. Vitamin D levels were not routinely measured but a loading dose of vitamin D (50,000 to 125,000 international units orally or IM) was given to patients and they were started on 1000 to 1500 mg of elemental calcium plus 800 to 1200 international units of vitamin D supplementation per day for at least 14 days prior to the study drug infusions. The incidence of all-cause mortality was 9.6% in the Reclast group and 13.3% in the placebo group. The incidence of serious adverse events was 38.3% in the Reclast group and 41.3% in the placebo group. The percentage of patients who withdrew from the study due to adverse events was 5.3% and 4.7% for the Reclast and placebo groups, respectively. Adverse reactions reported in at least 2% of patients with osteoporosis and more frequently in the Reclast-treated patients than placebo-treated patients in either osteoporosis trial are shown below in Table 1. Treatment with intravenous bisphosphonates, including zoledronic acid, has been associated with renal impairment manifested as deterioration in renal function (i.e., increased serum creatinine) and in rare cases, acute renal failure. In the clinical trial for postmenopausal osteoporosis, patients with baseline creatinine clearance less than 30 mL/min (based on actual body weight), urine dipstick greater than or equal to 2+ protein or increase in serum creatinine of greater than 0.5 mg/dL during the screening visits were excluded. The change in creatinine clearance (measured annually prior to dosing) and the incidence of renal failure and impairment was comparable for both the Reclast and placebo treatment groups over 3 years, including patients with creatinine clearance between 30-60 mL/min at baseline. Overall, there was a transient increase in serum creatinine observed within 10 days of dosing in 1.8% of Reclast-treated patients versus 0.8% of placebo-treated patients which resolved without specific therapy [see Warnings and Precautions (5.3)]. The signs and symptoms of acute phase reaction occurred in Study 1 following Reclast infusion including fever (18%), myalgia (9%), flu-like symptoms (8%), headache (7%), and arthralgia (7%). The majority of these symptoms occurred within the first 3 days following the dose of Reclast and usually resolved within 3 days of onset but resolution could take up to 7-14 days. In Study 2, patients without a contraindication to acetaminophen were provided with a standard oral dose at the time of the IV infusion and instructed to use additional acetaminophen at home for the next 72 hours as needed. Reclast was associated with fewer signs and symptoms of a transient acute phase reaction in this trial: fever (7%) and arthralgia (3%). The incidence of these symptoms decreased with subsequent doses of Reclast. In Study 1, in women with postmenopausal osteoporosis, approximately 0.2% of patients had notable declines of serum calcium levels (less than 7.5 mg/dL) following Reclast administration. No symptomatic cases of hypocalcemia were observed. In Study 2, following pre-treatment with vitamin D, no patients had treatment emergent serum calcium levels below 7.5 mg/dL. In the osteoporosis trials, local reactions at the infusion site such as itching, redness and/or pain have been reported in 0% to 0.7% of patients following the administration of Reclast and 0% to 0.5% of patients following administration of placebo. In the postmenopausal osteoporosis trial, Study 1, in 7736 patients, after initiation of therapy, symptoms consistent with ONJ occurred in one patient treated with placebo and one patient treated with Reclast. Both cases resolved after appropriate treatment [see Warnings and Precautions (5.4)]. No reports of osteonecrosis of the jaw were reported in either treatment group in Study 2. In the postmenopausal osteoporosis trial, Study 1, adjudicated serious adverse events of atrial fibrillation in the zoledronic acid treatment group occurred in 1.3% of patients (50 out of 3862) compared to 0.4% (17 out of 3852) in the placebo group. The overall incidence of all atrial fibrillation adverse events in the zoledronic acid treatment group was reported in 2.5% of patients (96 out of 3862) in the Reclast group vs. 1.9% of patients (75 out of 3852) in the placebo group. Over 90% of these events in both treatment groups occurred more than a month after the infusion. In an ECG sub-study, ECG measurements were performed on a subset of 559 patients before and 9 to 11 days after treatment. There was no difference in the incidence of atrial fibrillation between treatment groups suggesting these events were not related to the acute infusions. In Study 2, adjudicated serious adverse events of atrial fibrillation in the zoledronic acid treatment group occurred in 1.0% of patients (11 out of 1054) compared to 1.2% (13 out of 1057) in the placebo group demonstrating no difference between treatment groups. Cases of iritis/uveitis/episcleritis/conjunctivitis have been reported in patients treated with bisphosphonates, including zoledronic acid. In the osteoporosis trials, 1 (less than 0.1%) to 9 (0.2%) patients treated with Reclast and 0 (0%) to 1 (less than 0.1%) patient treated with placebo developed iritis/uveitis/episcleritis. The safety of Reclast in postmenopausal women with osteopenia (low bone mass) was assessed in a 2-year randomized, multi-center, double-blind, placebo-controlled study of 581 postmenopausal women aged greater than or equal to 45 years. Patients were randomized to one of three treatment groups: (1) Reclast given at randomization and Month 12 (n=198); (2) Reclast given at randomization and placebo at Month 12 (n=181); and (3) placebo given at randomization and Month 12 (n=202). Reclast was administered as a single 5 mg dose in 100 mL solution infused over at least 15 minutes. All women received 500 to 1200 mg elemental calcium plus 400 to 800 international units vitamin D supplementation per day. The incidence of serious adverse events was similar for subjects given (1) Reclast at randomization and at Month 12 (10.6%), (2) Reclast at randomization and placebo given at Month 12 (9.4%), and (3) placebo at randomization and at Month 12 (11.4%). The percentages of patients who withdrew from the study due to adverse events were 7.1%, 7.2%, and 3.0% in the two Reclast groups and placebo group, respectively. Adverse reactions reported in at least 2% of patients with osteopenia and more frequently in the Reclast-treated patients than placebo-treated patients are shown in Table 2. Cases of iritis/uveitis/episcleritis/conjunctivitis have been reported in patients treated with bisphosphonates, including zoledronic acid. In the osteoporosis prevention trial, 4 (1.1%) patients treated with Reclast and 0 (0%) patients treated with placebo developed iritis/uveitis. In patients given Reclast at randomization and placebo at Month 12, Reclast was associated with signs and symptoms of an acute phase reaction: myalgia (20.4%), fever (19.3%), chills (18.2%), pain (13.8%), headache (13.3%), fatigue (8.3%), arthralgia (6.1%), pain in extremity (3.9%), influenza-like illness (3.3%), and back pain (1.7%), which occurred within the first 3 days following the dose of Reclast. The majority of these symptoms were mild to moderate and resolved within 3 days of the event onset but resolution could take up to 7-14 days. The safety of Reclast in men with osteoporosis or osteoporosis secondary to hypogonadism was assessed in a two year randomized, multicenter, double-blind, active controlled group study of 302 men aged 25 to 86 years. One hundred fifty three (153) patients were exposed to Reclast administered once annually with a 5 mg dose in 100 mL infused over 15 minutes for up to a total of two doses, and 148 patients were exposed to a commercially-available oral weekly bisphosphonate (active control) for up to two years. All participants received 1000 mg of elemental calcium plus 800 to 1000 international units of vitamin D supplementation per day. The incidence of all-cause mortality (one in each group) and serious adverse events were similar between the Reclast and active control treatment groups. The percentage of patients experiencing at least one adverse event was comparable between the Reclast and active control groups, with the exception of a higher incidence of post-dose symptoms in the Reclast group that occurred within 3 days after infusion. The overall safety and tolerability of Reclast was similar to the active control. Adverse reactions reported in at least 2% of men with osteoporosis and more frequently in the Reclast-treated patients than the active control-treated patients and either (1) not reported in the postmenopausal osteoporosis treatment trial or (2) reported more frequently in the trial of osteoporosis in men are presented in Table 3. Therefore, Table 3 should be viewed in conjunction with Table 1. Creatinine clearance was measured annually prior to dosing and changes in long-term renal function over 24 months were comparable in the Reclast and active control groups [see Warnings and Precautions (5.3)]. Reclast was associated with signs and symptoms of an acute phase reaction: myalgia (17.1%), fever (15.7%), fatigue (12.4%), arthralgia (11.1%), pain (10.5%), chills (9.8%), headache (9.8%), influenza-like illness (8.5%), malaise (5.2%), and back pain (3.3%), which occurred within the first 3 days following the dose of Reclast. The majority of these symptoms were mild to moderate and resolved within 3 days of the event onset but resolution could take up to 7-14 days. The incidence of these symptoms decreased with subsequent doses of Reclast. The incidence of all atrial fibrillation adverse events in the Reclast treatment group was 3.3% (5 out of 153) compared to 2.0% (3 out of 148) in the active control group. However, there were no patients with adjudicated serious adverse events of atrial fibrillation in the Reclast treatment group. There were no patients who had treatment emergent serum calcium levels below 7.5 mg/dL. There were 4 patients (2.6%) on Reclast vs. 2 patients (1.4%) on active control with local site reactions. In this trial there were no cases of osteonecrosis of the jaw [see Warnings and Precautions (5.4)]. The safety of Reclast in men and women in the treatment and prevention of glucocorticoid-induced osteoporosis was assessed in a randomized, multicenter, double-blind, active controlled, stratified study of 833 men and women aged 18 to 85 years treated with greater than or equal to 7.5 mg/day oral prednisone (or equivalent). Patients were stratified according to the duration of their pre-study corticosteroid therapy: less than or equal to 3 months prior to randomization (prevention subpopulation), and greater than 3 months prior to randomization (treatment subpopulation). The duration of the trial was one year with 416 patients exposed to Reclast administered once as a single 5 mg dose in 100 mL infused over 15 minutes, and 417 patients exposed to a commercially-available oral daily bisphosphonate (active control) for one year. All participants received 1000 mg of elemental calcium plus 400 to 1000 international units of vitamin D supplementation per day. The incidence of all–cause mortality was similar between treatment groups: 0.9% in the Reclast group and 0.7% in the active control group. The incidence of serious adverse events was similar between the Reclast treatment and prevention groups, 18.4% and 18.1%, respectively, and the active control treatment and prevention groups, 19.8% and 16.0%, respectively. The percentage of subjects who withdrew from the study due to adverse events was 2.2% in the Reclast group vs. 1.4% in the active control group. The overall safety and tolerability were similar between Reclast and active control groups with the exception of a higher incidence of post-dose symptoms in the Reclast group that occurred within 3 days after infusion. The overall safety and tolerability profile of Reclast in glucocorticoid-induced osteoporosis was similar to the adverse events reported in the Reclast postmenopausal osteoporosis clinical trial. Adverse reactions reported in at least 2% of patients that were either not reported in the postmenopausal osteoporosis treatment trial or reported more frequently in the treatment and prevention of glucocorticoid-induced osteoporosis trial included the following: abdominal pain (Reclast 7.5%; active control 5.0%), and musculoskeletal pain (Reclast 3.1%; active control 1.7%). Other musculoskeletal events included back pain (Reclast 4.3%, active control 6.2%), bone pain (Reclast 3.1%, active control 2.2%), and pain in the extremity (Reclast 3.1%, active control 1.2%). In addition, the following adverse events occurred more frequently than in the postmenopausal osteoporosis trial: nausea (Reclast 9.6%; active control 8.4%), and dyspepsia (Reclast 5.5%; active control 4.3%). Renal function measured prior to dosing and at the end of the 12 month study was comparable in the Reclast and active control groups [see Warnings and Precautions (5.3)]. Reclast was associated with signs and symptoms of a transient acute phase reaction that was similar to that seen in the Reclast postmenopausal osteoporosis clinical trial. The incidence of atrial fibrillation adverse events was 0.7% (3 of 416) in the Reclast group compared to no adverse events in the active control group. All subjects had a prior history of atrial fibrillation and no cases were adjudicated as serious adverse events. One patient had atrial flutter in the active control group. There were no local reactions at the infusion site. In the Paget’s disease trials, two 6-month, double-blind, comparative, multinational studies of 349 men and women aged greater than 30 years with moderate to severe disease and with confirmed Paget’s disease of bone, 177 patients were exposed to Reclast and 172 patients exposed to risedronate. Reclast was administered once as a single 5 mg dose in 100 mL solution infused over at least 15 minutes. Risedronate was given as an oral daily dose of 30 mg for 2 months. The incidence of serious adverse events was 5.1% in the Reclast group and 6.4% in the risedronate group. The percentage of patients who withdrew from the study due to adverse events was 1.7% and 1.2% for the Reclast and risedronate groups, respectively. Adverse reactions occurring in at least 2% of the Paget’s patients receiving Reclast (single 5 mg intravenous infusion) or risedronate (30 mg oral daily dose for 2 months) over a 6-month study period are listed by system organ class in Table 4. In the Paget’s disease trials, early, transient decreases in serum calcium and phosphate levels were observed. Approximately 21% of patients had serum calcium levels less than 8.4 mg/dL 9-11 days following Reclast administration. In clinical trials in Paget’s disease there were no cases of renal deterioration following a single 5 mg 15-minute infusion [see Warnings and Precautions (5.3)]. The signs and symptoms of acute phase reaction (influenza-like illness, pyrexia, myalgia, arthralgia, and bone pain) were reported in 25% of patients in the Reclast-treated group compared to 8% in the risedronate-treated group. Symptoms usually occur within the first 3 days following Reclast administration. The majority of these symptoms resolved within 4 days of onset. Osteonecrosis of the jaw has been reported with zoledronic acid [see Warnings and Precautions (5.4)]. Fever, headache, flu-like symptoms, nausea, vomiting, diarrhea, arthralgia, and myalgia. Symptoms may be significant and lead to dehydration. Acute renal failure requiring hospitalization and/or dialysis or with a fatal outcome have been rarely reported. Increased serum creatinine was reported in patients with 1) underlying renal disease, 2) dehydration secondary to fever, sepsis, gastrointestinal losses, or diuretic therapy, or 3) other risk factors such as advanced age, or concomitant nephrotoxic drugs in the post-infusion period. Transient rise in serum creatinine can be correctable with intravenous fluids. Allergic reactions with intravenous zoledronic acid including anaphylactic reaction/shock, urticaria, angioedema, Stevens-Johnson syndrome, toxic epidermal necrolysis, and bronchoconstriction have been reported. Asthma exacerbations have been reported. Osteonecrosis of the jaw has been reported. Cases of osteonecrosis of other bones (including femur, hip, knee, ankle, wrist and humerus) have been reported; causality has not been determined in the population treated with Reclast. Cases of the following events have been reported: conjunctivitis, iritis, iridocyclitis, uveitis, episcleritis, scleritis and orbital inflammation/edema. Hypotension in patients with underlying risk factors has been reported. No in vivo drug interaction studies have been performed for Reclast. In vitro and ex vivo studies showed low affinity of zoledronic acid for the cellular components of human blood. In vitro mean zoledronic acid protein binding in human plasma ranged from 28% at 200 ng/mL to 53% at 50 ng/mL. In vivo studies showed that zoledronic acid is not metabolized, and is excreted into the urine as the intact drug. Caution is advised when bisphosphonates, including zoledronic acid, are administered with aminoglycosides, since these agents may have an additive effect to lower serum calcium level for prolonged periods. This effect has not been reported in zoledronic acid clinical trials. Caution should also be exercised when Reclast is used in combination with loop diuretics due to an increased risk of hypocalcemia. Caution is indicated when Reclast is used with other potentially nephrotoxic drugs such as nonsteroidal anti-inflammatory drugs. Renal impairment has been observed following the administration of zoledronic acid in patients with pre-existing renal compromise or other risk factors [see Warnings and Precautions (5.3)]. In patients with renal impairment, the exposure to concomitant medications that are primarily renally excreted (e.g., digoxin) may increase. Consider monitoring serum creatinine in patients at risk for renal impairment who are taking concomitant medications that are primarily excreted by the kidney. Pregnancy Category D [see Warnings and Precautions (5.6)]. RECLAST SHOULD NOT BE USED DURING PREGNANCY. If the patient becomes pregnant while taking this drug, the patient should be apprised of the potential harm to the fetus. Women of childbearing potential should be advised to avoid becoming pregnant while receiving Reclast. Bisphosphonates are incorporated into the bone matrix, from where they are gradually released over periods of weeks to years. The extent of bisphosphonate incorporation into adult bone, and hence, the amount available for release back into the systemic circulation, is directly related to the total dose and duration of bisphosphonate use. Although there are no data on fetal risk in humans, bisphosphonates do cause fetal harm in animals, and animal data suggest that uptake of bisphosphonates into fetal bone is greater than into maternal bone. Therefore, there is a theoretical risk of fetal harm (e.g., skeletal and other abnormalities) if a woman becomes pregnant after completing a course of bisphosphonate therapy. The impact of variables such as time between cessation of bisphosphonate therapy to conception space, the particular bisphosphonate used, and the route of administration (intravenous versus oral) on this risk has not been established. In female rats given daily subcutaneous doses of zoledronic acid beginning 15 days before mating and continuing through gestation, the number of stillbirths was increased and survival of neonates was decreased at approximately greater than or equal to 0.3 times the anticipated human systemic exposure following a 5 mg intravenous dose (based on an AUC comparison). Adverse maternal effects were observed in all dose groups at greater than or equal to 0.1 times the human systemic exposure following a 5 mg intravenous dose (based on an AUC comparison) and included dystocia and periparturient mortality in pregnant rats allowed to deliver. Maternal mortality was considered related to drug-induced inhibition of skeletal calcium mobilization, resulting in periparturient hypocalcemia. This appears to be a bisphosphonate class effect. In pregnant rats given daily subcutaneous dose of zoledronic acid during gestation, adverse fetal effects were observed at about 2 and 4 times human systemic exposure following a 5 mg intravenous dose (based on an AUC comparison). These adverse effects included increases in pre- and post-implantation losses, decreases in viable fetuses, and fetal skeletal, visceral, and external malformations. In pregnant rabbits given daily subcutaneous doses of zoledronic acid during gestation at doses less than or equal to 0.4 times the anticipated human systemic exposure following a 5 mg intravenous dose (based on a mg/m2 comparison) no adverse fetal effects were observed. Maternal mortality and abortion occurred in all treatment groups (at doses greater than or equal to 0.04 times the human 5 mg intravenous dose, based on a mg/m2 comparison). Adverse maternal effects were associated with, and may have been caused by, drug-induced hypocalcemia [see Nonclinical Toxicology (13.3)]. It is not known whether Reclast is excreted in human milk. Because many drugs are excreted in human milk, and because Reclast binds to bone long-term, Reclast should not be administered to a nursing woman. Reclast is not indicated for use in children. The safety and effectiveness of zoledronic acid was studied in a one-year active controlled trial of 152 pediatric subjects (74 receiving zoledronic acid). The enrolled population was subjects with severe osteogenesis imperfecta, aged 1 to 17 years, 55% male, 84% Caucasian, with a mean lumbar spine BMD of 0.431 gm/cm2, which is 2.7 standard deviations below the mean for age-matched controls (BMD Z-score of -2.7). At one year, increases in BMD were observed in the zoledronic acid treatment group. However, changes in BMD in individual patients with severe osteogenesis imperfecta did not necessarily correlate with the risk for fracture or the incidence or severity of chronic bone pain. The adverse events observed with zoledronic acid use in children did not raise any new safety findings beyond those previously seen in adults treated for Paget’s disease of bone and treatment of osteoporosis including osteonecrosis of the jaw (ONJ) and renal impairment. However, adverse reactions seen more commonly in pediatric patients included pyrexia (61%), arthralgia (26%), hypocalcemia (22%) and headache (22%). These reactions, excluding arthralgia, occurred most frequently within three days after the first infusion and became less common with repeat dosing. No cases of ONJ or renal impairment were observed in this study. Because of long-term retention in bone, Reclast should only be used in children if the potential benefit outweighs the potential risk. Plasma zoledronic acid concentration data was obtained from 10 patients with severe osteogenesis imperfecta (4 in the age group of 3 to 8 years and 6 in the age group of 9 to 17 years) infused with 0.05 mg/kg dose over 30 minutes. Mean Cmax and AUC(0-last) was 167 ng/mL and 220 ng.h/mL respectively. The plasma concentration time profile of zoledronic acid in pediatric patients represent a multi-exponential decline, as observed in adult cancer patients at an approximately equivalent mg/kg dose. The combined osteoporosis trials included 4863 Reclast-treated patients who were at least 65 years of age, while 2101 patients were at least 75 years old. No overall differences in efficacy or safety were observed between patients under 75 years of age with those at least 75 years of age, except that the acute phase reactions occurred less frequently in the older patients. Of the patients receiving Reclast in the osteoporosis study in men, glucocorticoid-induced osteoporosis, and Paget’s disease studies, 83, 116, and 132 patients, respectively were 65 years of age or over, while 24, 29, and 68 patients, respectively were at least 75 years of age. However, because decreased renal function occurs more commonly in the elderly, special care should be taken to monitor renal function. Reclast is contraindicated in patients with creatinine clearance less than 35 mL/min and in those with evidence of acute renal impairment. There are no safety or efficacy data to support the adjustment of the Reclast dose based on baseline renal function. Therefore, no dosage adjustment is required in patients with a creatinine clearance of greater than or equal to 35 mL/min [see Warnings and Precautions (5.3), Clinical Pharmacology (12.3)]. Risk of acute renal failure may increase with underlying renal disease and dehydration secondary to fever, sepsis, gastrointestinal losses, diuretic therapy, advanced age, etc. [see Adverse Reactions (6.2)]. Reclast is not metabolized in the liver. No clinical data are available for use of Reclast in patients with hepatic impairment. Clinical experience with acute overdosage of zoledronic acid (Reclast) solution for intravenous infusion is limited. Patients who have received doses higher than those recommended should be carefully monitored. Overdosage may cause clinically significant renal impairment, hypocalcemia, hypophosphatemia, and hypomagnesemia. Clinically relevant reductions in serum levels of calcium, phosphorus, and magnesium should be corrected by intravenous administration of calcium gluconate, potassium or sodium phosphate, and magnesium sulfate, respectively. Single doses of Reclast should not exceed 5 mg and the duration of the intravenous infusion should be no less than 15 minutes [see Dosage and Administration (2)]. Zoledronic acid monohydrate is a white crystalline powder. Its molecular formula is C5H10N2O7P2 • H2O and a molar mass of 290.1 g/Mol. Zoledronic acid monohydrate is highly soluble in 0.1N sodium hydroxide solution, sparingly soluble in water and 0.1N hydrochloric acid, and practically insoluble in organic solvents. The pH of the Reclast solution for infusion is approximately 6.0 – 7.0. 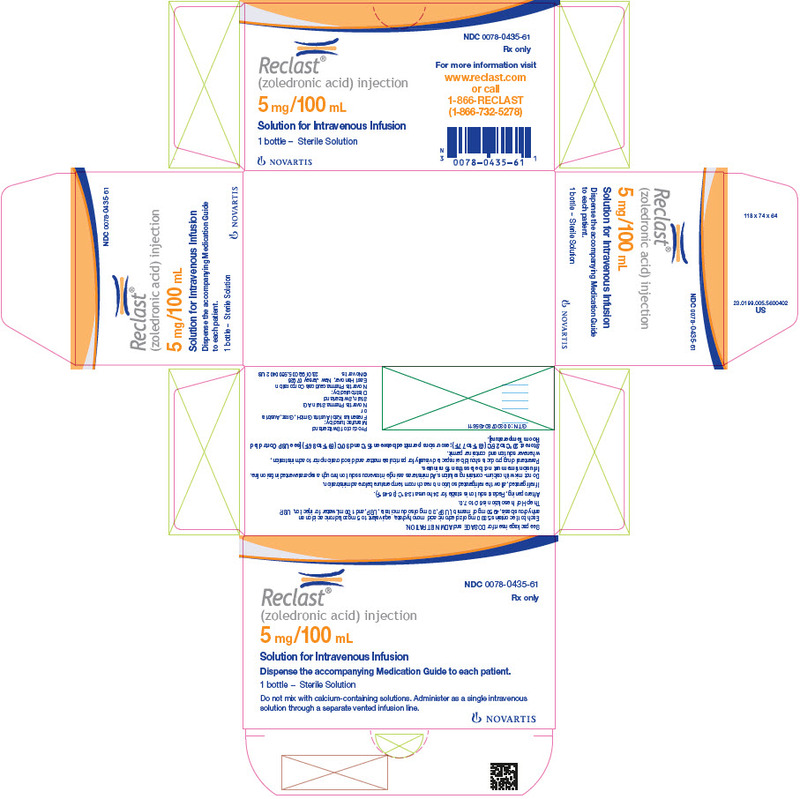 Reclast Injection is available as a sterile solution in bottles for intravenous infusion. One bottle with 100 mL solution contains 5.330 mg of zoledronic acid monohydrate, equivalent to 5 mg zoledronic acid on an anhydrous basis. Reclast is a bisphosphonate and acts primarily on bone. It is an inhibitor of osteoclast-mediated bone resorption. The selective action of bisphosphonates on bone is based on their high affinity for mineralized bone. Intravenously administered zoledronic acid rapidly partitions to bone and localizes preferentially at sites of high bone turnover. The main molecular target of zoledronic acid in the osteoclast is the enzyme farnesyl pyrophosphate synthase. The relatively long duration of action of zoledronic acid is attributable to its high binding affinity to bone mineral. In the osteoporosis treatment trial, the effect of Reclast treatment on markers of bone resorption (serum beta-C-telopeptides [b-CTx]) and bone formation (bone specific alkaline phosphatase [BSAP], serum N-terminal propeptide of type I collagen [P1NP]) was evaluated in patients (subsets ranging from 517 to 1246 patients) at periodic intervals. Treatment with a 5 mg annual dose of Reclast reduces bone turnover markers to the pre-menopausal range with an approximate 55% reduction in b-CTx, a 29% reduction in BSAP and a 52% reduction in P1NP over 36 months. There was no progressive reduction of bone turnover markers with repeated annual dosing. Pharmacokinetic data in patients with osteoporosis and Paget's disease of bone are not available. Distribution: Single or multiple (every 28 days) 5-minute or 15-minute infusions of 2, 4, 8 or 16 mg zoledronic acid were given to 64 patients with cancer and bone metastases. The post-infusion decline of zoledronic acid concentrations in plasma was consistent with a triphasic process showing a rapid decrease from peak concentrations at end-of-infusion to less than 1% of Cmax 24 hours post infusion with population half-lives of t1/2α 0.24 hour and t1/2β 1.87 hours for the early disposition phases of the drug. The terminal elimination phase of zoledronic acid was prolonged, with very low concentrations in plasma between Days 2 and 28 post infusion, and a terminal elimination half-life t1/2γ of 146 hours. The area under the plasma concentration versus time curve (AUC0-24h) of zoledronic acid was dose proportional from 2 to 16 mg. The accumulation of zoledronic acid measured over three cycles was low, with mean AUC0-24h ratios for cycles 2 and 3 versus 1 of 1.13 ± 0.30 and 1.16 ± 0.36, respectively. In vitro and ex vivo studies showed low affinity of zoledronic acid for the cellular components of human blood. In vitro mean zoledronic acid protein binding in human plasma ranged from 28% at 200 ng/mL to 53% at 50 ng/mL. Metabolism: Zoledronic acid does not inhibit human P450 enzymes in vitro. Zoledronic acid does not undergo biotransformation in vivo. In animal studies, less than 3% of the administered intravenous dose was found in the feces, with the balance either recovered in the urine or taken up by bone, indicating that the drug is eliminated intact via the kidney. Following an intravenous dose of 20 nCi 14C-zoledronic acid in a patient with cancer and bone metastases, only a single radioactive species with chromatographic properties identical to those of parent drug was recovered in urine, which suggests that zoledronic acid is not metabolized. Excretion: In 64 patients with cancer and bone metastases on average (± SD) 39 ± 16% of the administered zoledronic acid dose was recovered in the urine within 24 hours, with only trace amounts of drug found in urine post Day 2. The cumulative percent of drug excreted in the urine over 0-24 hours was independent of dose. The balance of drug not recovered in urine over 0-24 hours, representing drug presumably bound to bone, is slowly released back into the systemic circulation, giving rise to the observed prolonged low plasma concentrations. The 0-24 hour renal clearance of zoledronic acid was 3.7 ± 2.0 L/h. Zoledronic acid clearance was independent of dose but dependent upon the patient’s creatinine clearance. In a study in patients with cancer and bone metastases, increasing the infusion time of a 4 mg dose of zoledronic acid from 5 minutes (n=5) to 15 minutes (n=7) resulted in a 34% decrease in the zoledronic acid concentration at the end of the infusion ([mean ± SD] 403 ± 118 ng/mL vs. 264 ± 86 ng/mL) and a 10% increase in the total AUC (378 ± 116 ng x h/mL vs. 420 ± 218 ng x h/mL). The difference between the AUC means was not statistically significant. Pediatrics: Reclast is not indicated for use in children [see Pediatric Use (8.4)]. Geriatrics: The pharmacokinetics of zoledronic acid was not affected by age in patients with cancer and bone metastases whose age ranged from 38 years to 84 years. Race: The pharmacokinetics of zoledronic acid was not affected by race in patients with cancer and bone metastases. Hepatic Impairment: No clinical studies were conducted to evaluate the effect of hepatic impairment on the pharmacokinetics of zoledronic acid. Renal Impairment: The pharmacokinetic studies conducted in 64 cancer patients represented typical clinical populations with normal to moderately-impaired renal function. Compared to patients with creatinine clearance greater than 80 mL/min (N=37), patients with creatinine clearance = 50-80 mL/min (N=15) showed an average increase in plasma AUC of 15%, whereas patients with creatinine clearance = 30-50 mL/min (N=11) showed an average increase in plasma AUC of 43%. No dosage adjustment is required in patients with a creatinine clearance of greater than or equal to 35 mL/min. Reclast is contraindicated in patients with creatinine clearance less than 35 mL/min and in those with evidence of acute renal impairment due to an increased risk of renal failure [see Contraindications (4), Warnings and Precautions (5.3), Use in Specific Populations (8.6)]. Carcinogenesis: Standard lifetime carcinogenicity bioassays were conducted in mice and rats. Mice were given daily oral doses of zoledronic acid of 0.1, 0.5, or 2.0 mg/kg/day. There was an increased incidence of Harderian gland adenomas in males and females in all treatment groups (at doses greater than or equal to 0.002 times the human intravenous dose of 5 mg, based on a mg/m2 comparison). Rats were given daily oral doses of zoledronic acid of 0.1, 0.5, or 2.0 mg/kg/day. No increased incidence of tumors was observed (at doses less than or equal to 0.1 times the human intravenous dose of 5 mg, based on a mg/m2 comparison). Mutagenesis: Zoledronic acid was not genotoxic in the Ames bacterial mutagenicity assay, in the Chinese hamster ovary cell assay, or in the Chinese hamster gene mutation assay, with or without metabolic activation. Zoledronic acid was not genotoxic in the in vivo rat micronucleus assay. Impairment of Fertility: Female rats were given daily subcutaneous doses of zoledronic acid of 0.01, 0.03, or 0.1 mg/kg beginning 15 days before mating and continuing through gestation. Effects observed in the high-dose group (equivalent to human systemic exposure following a 5 mg intravenous dose, based on an AUC comparison) included inhibition of ovulation and a decrease in the number of pregnant rats. Effects observed in both the mid-dose group and high-dose group (0.3 to 1 times human systemic exposure following a 5 mg intravenous dose, based on an AUC comparison) included an increase in pre-implantation losses and a decrease in the number of implantations and live fetuses. Bone Safety Studies: Zoledronic acid is a potent inhibitor of osteoclastic bone resorption. In the ovariectomized rat, single IV doses of zoledronic acid of 4-500 mcg/kg (less than 0.1 to 3.5 times human exposure at the 5 mg intravenous dose, based on a mg/m2 comparison) suppressed bone turnover and protected against trabecular bone loss, cortical thinning and the reduction in vertebral and femoral bone strength in a dose-dependent manner. At a dose equivalent to human exposure at the 5 mg intravenous dose, the effect persisted for 8 months, which corresponds to approximately 8 remodeling cycles or 3 years in humans. In ovariectomized rats and monkeys, weekly treatment with zoledronic acid dose-dependently suppressed bone turnover and prevented the decrease in cancellous and cortical BMD and bone strength, at yearly cumulative doses up to 3.5 times the intravenous human dose of 5 mg, based on a mg/m2 comparison. Bone tissue was normal and there was no evidence of a mineralization defect, no accumulation of osteoid, and no woven bone. In female rats given subcutaneous doses of zoledronic acid of 0.01, 0.03, or 0.1 mg/kg/day beginning 15 days before mating and continuing through gestation, the number of stillbirths was increased and survival of neonates was decreased in the mid- and high-dose groups (greater than or equal to 0.3 times the anticipated human systemic exposure following a 5 mg intravenous dose, based on an AUC comparison). Adverse maternal effects were observed in all dose groups (greater than or equal to 0.1 times the human systemic exposure following a 5 mg intravenous dose, based on an AUC comparison) and included dystocia and periparturient mortality in pregnant rats allowed to deliver. Maternal mortality was considered related to drug-induced inhibition of skeletal calcium mobilization, resulting in periparturient hypocalcemia. This appears to be a bisphosphonate class effect. In pregnant rats given daily subcutaneous dose of zoledronic acid of 0.1, 0.2, or 0.4 mg/kg during gestation, adverse fetal effects were observed in the mid- and high-dose groups (about 2 and 4 times human systemic exposure following a 5 mg intravenous dose, based on an AUC comparison). These adverse effects included increases in pre- and post-implantation losses, decreases in viable fetuses, and fetal skeletal, visceral, and external malformations. Fetal skeletal effects observed in the high-dose group included unossified or incompletely ossified bones, thickened, curved or shortened bones, wavy ribs, and shortened jaw. Other adverse fetal effects observed in the high-dose group included reduced lens, rudimentary cerebellum, reduction or absence of liver lobes, reduction of lung lobes, vessel dilation, cleft palate, and edema. Skeletal variations were also observed in the low-dose group (about 1.2 times the anticipated human systemic exposure, based on an AUC comparison). Signs of maternal toxicity were observed in the high-dose group and included reduced body weights and food consumption, indicating that maximal exposure levels were achieved in this study. In pregnant rabbits given subcutaneous doses of zoledronic acid of 0.01, 0.03, or 0.1 mg/kg/day during gestation (at doses less than or equal to 0.4 times the anticipated human systemic exposure following a 5 mg intravenous dose, based on a mg/m2 comparison) no adverse fetal effects were observed. Maternal mortality and abortion occurred in all treatment groups (at doses greater than or equal to 0.04 times the human 5 mg intravenous dose, based on a mg/m2 comparison). Adverse maternal effects were associated with, and may have been caused by, drug-induced hypocalcemia. Study 1: The efficacy and safety of Reclast in the treatment of postmenopausal osteoporosis was demonstrated in Study 1, a randomized, double-blind, placebo-controlled, multinational study of 7736 women aged 65 to 89 years (mean age of 73) with either: a femoral neck BMD T-score less than or equal to -1.5 and at least two mild or one moderate existing vertebral fracture(s); or a femoral neck BMD T-score less than or equal to -2.5 with or without evidence of an existing vertebral fracture(s). Women were stratified into two groups: Stratum I: no concomitant use of osteoporosis therapy or Stratum II: baseline concomitant use of osteoporosis therapies which included calcitonin, raloxifene, tamoxifen, and hormone replacement therapy, but excluded other bisphosphonates. Women enrolled in Stratum I (n=5661) were evaluated annually for incidence of vertebral fractures. All women (Strata I and II) were evaluated for the incidence of hip and other clinical fractures. Reclast was administered once a year for three consecutive years, as a single 5 mg dose in 100 mL solution infused over at least 15 minutes, for a total of three doses. All women received 1000 to 1500 mg of elemental calcium plus 400 to 1200 international units of vitamin D supplementation per day. The two primary efficacy variables were the incidence of morphometric vertebral fractures at 3 years and the incidence of hip fractures over a median duration of 3 years. The diagnosis of an incident vertebral fracture was based on both qualitative diagnosis by the radiologist and quantitative morphometric criterion. The morphometric criterion required the dual occurrence of 2 events: a relative height ratio or relative height reduction in a vertebral body of at least 20%, together with at least a 4 mm absolute decrease in height. Reclast significantly decreased the incidence of new vertebral fractures at one, two, and three years as shown in Table 5. The reductions in vertebral fractures over three years were consistent (including new/worsening and multiple vertebral fractures) and significantly greater than placebo regardless of age, geographical region, baseline body mass index, number of baseline vertebral fractures, femoral neck BMD T-score, or prior bisphosphonate usage. Reclast demonstrated a 1.1% absolute reduction and 41% relative reduction in the risk of hip fractures over a median duration of follow-up of 3 years. The hip fracture event rate was 1.4% for Reclast-treated patients compared to 2.5% for placebo-treated patients. The reductions in hip fractures over three years were greater for Reclast than placebo regardless of femoral neck BMD T-score. Reclast demonstrated superiority to placebo in reducing the incidence of all clinical fractures, clinical (symptomatic) vertebral and non-vertebral fractures (excluding finger, toe, facial, and clinical thoracic and lumbar vertebral fractures). All clinical fractures were verified based on the radiographic and/or clinical evidence. A summary of results is presented in Table 6. Reclast significantly increased BMD at the lumbar spine, total hip and femoral neck, relative to treatment with placebo at time points 12, 24, and 36 months. Treatment with Reclast resulted in a 6.7% increase in BMD at the lumbar spine, 6.0% at the total hip, and 5.1% at the femoral neck, over 3 years as compared to placebo. Bone biopsy specimens were obtained between Months 33 and 36 from 82 postmenopausal patients with osteoporosis treated with 3 annual doses of Reclast. Of the biopsies obtained, 81 were adequate for qualitative histomorphometry assessment, 59 were adequate for partial quantitative histomorphometry assessment, and 38 were adequate for full quantitative histomorphometry assessment. Micro CT analysis was performed on 76 specimens. Qualitative, quantitative and micro CT assessments showed bone of normal architecture and quality without mineralization defects. In the 3-year osteoporosis study, standing height was measured annually using a stadiometer. The Reclast group revealed less height loss compared to placebo (4.2 mm vs. 7.0 mm, respectively [p<0.001]). Study 2: The efficacy and safety of Reclast in the treatment of patients with osteoporosis who suffered a recent low-trauma hip fracture was demonstrated in Study 2, a randomized, double-blind, placebo-controlled, multinational endpoint study of 2127 men and women aged 50 to 95 years (mean age of 74.5). Concomitant osteoporosis therapies excluding other bisphosphonates and parathyroid hormone were allowed. Reclast was administered once a year as a single 5 mg dose in 100 mL solution, infused over at least 15 minutes. The study continued until at least 211 patients had confirmed clinical fractures in the study population. Vitamin D levels were not routinely measured but a loading dose of vitamin D (50,000 to 125,000 international units orally or IM) was given to patients and they were started on 1000 to 1500 mg of elemental calcium plus 800 to 1200 international units of vitamin D supplementation per day for at least 14 days prior to the study drug infusions. The primary efficacy variable was the incidence of clinical fractures over the duration of the study. Reclast significantly reduced the incidence of any clinical fracture by 35%. There was also a 46% reduction in the risk of a clinical vertebral fracture (Table 7). Reclast significantly increased BMD relative to placebo at the hip and femoral neck at all timepoints (12, 24, and 36 months). Treatment with Reclast resulted in a 6.4% increase in BMD at the total hip and a 4.3% increase at the femoral neck over 36 months as compared to placebo. The efficacy and safety of Reclast in postmenopausal women with osteopenia (low bone mass) was assessed in a 2-year randomized, multi-center, double-blind, placebo-controlled study of 581 postmenopausal women aged greater than or equal to 45 years, who were stratified by years since menopause: Stratum I women less than 5 years from menopause (n=224); Stratum II women greater than or equal to 5 years from menopause (n=357). Patients within Stratum I and II were randomized to one of three treatment groups: (1) Reclast given at randomization and at Month 12 (n=77) in Stratum I and (n=121) in Stratum II; (2) Reclast given at randomization and placebo at Month 12 (n=70) in Stratum I and (n=111) in Stratum II; and (3) Placebo given at randomization and Month 12 (n=202). Reclast was administered as a single 5 mg dose in 100 mL solution infused over at least 15 minutes. All women received 500 to 1200 mg elemental calcium plus 400 to 800 international units vitamin D supplementation per day. The primary efficacy variable was the percent change of BMD at 24 Months relative to baseline. Reclast significantly increased lumbar spine BMD relative to placebo at Month 24 across both strata. Reclast given once at randomization (and placebo given at Month 12) resulted in 4.0% increase in BMD in Stratum I patients and 4.8% increase in Stratum II patients over 24 months. Placebo given at randomization and at Month 12 resulted in 2.2% decrease in BMD in Stratum I patients and 0.7% decrease in BMD in Stratum II patients over 24 months. Therefore, Reclast given once at randomization (and placebo given at Month 12) resulted in a 6.3% increase in BMD in Stratum I patients and 5.4% increase in Stratum II patients over 24 months as compared to placebo (both p<0.0001). 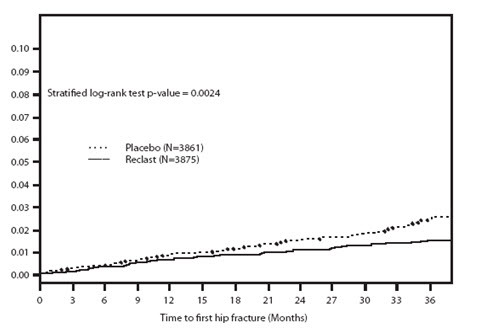 Reclast also significantly increased total hip BMD relative to placebo at Month 24 across both strata. Reclast given once at randomization (and placebo given at Month 12) resulted in 2.6% increase in BMD in Stratum I patients and 2.1% in Stratum II patients over 24 months. Placebo given at randomization and at Month 12 resulted in 2.1% decrease in BMD in Stratum I patients and 1.0% decrease in BMD in Stratum II patients over 24 months. Therefore, Reclast given once at randomization (and placebo given at Month 12) resulted in a 4.7% increase in BMD in Stratum I patients and 3.2% increase in Stratum II patients over 24 months as compared to placebo (both p<0.0001). The efficacy and safety of Reclast in men with osteoporosis or significant osteoporosis secondary to hypogonadism, was assessed in a randomized, multicenter, double-blind, active controlled, study of 302 men aged 25 to 86 years (mean age of 64). The duration of the trial was two years. Patients were randomized to either Reclast which was administered once annually as a 5 mg dose in 100 mL infused over 15 minutes for a total of up to two doses, or to an oral weekly bisphosphonate (active control) for up to two years. All participants received 1000 mg of elemental calcium plus 800 to 1000 international units of vitamin D supplementation per day. An annual infusion of Reclast was non-inferior to the oral weekly bisphosphonate active control based on the percentage change in lumbar spine BMD at Month 24 relative to baseline (Reclast: 6.1% increase; active control: 6.2% increase). The efficacy and safety of Reclast to prevent and treat glucocorticoid-induced osteoporosis (GIO) was assessed in a randomized, multicenter, double-blind, stratified, active controlled study of 833 men and women aged 18 to 85 years (mean age of 54.4 years) treated with greater than or equal to 7.5 mg/day oral prednisone (or equivalent). Patients were stratified according to the duration of their pre-study corticosteroid therapy: less than or equal to 3 months prior to randomization (prevention subpopulation), and greater than 3 months prior to randomization (treatment subpopulation). The duration of the trial was one year. Patients were randomized to either Reclast which was administered once as a 5 mg dose in 100 mL infused over 15 minutes, or to an oral daily bisphosphonate (active control) for one year. All participants received 1000 mg of elemental calcium plus 400 to 1000 international units of vitamin D supplementation per day. In the GIO treatment subpopulation, Reclast demonstrated a significant mean increase in lumbar spine BMD compared to the active control at one year (Reclast 4.1%, active control 2.7%) with a treatment difference of 1.4% (p<0.001). In the GIO prevention subpopulation, Reclast demonstrated a significant mean increase in lumbar spine BMD compared to active control at one year (Reclast 2.6%, active control 0.6%) with a treatment difference of 2.0% (p<0.001). Bone biopsy specimens were obtained from 23 patients (12 in the Reclast treatment group and 11 in the active control treatment group) at Month 12 treated with an annual dose of Reclast or daily oral active control. Qualitative assessments showed bone of normal architecture and quality without mineralization defects. Apparent reductions in activation frequency and remodeling rates were seen when compared with the histomorphometry results seen with Reclast in the postmenopausal osteoporosis population. The long-term consequences of this degree of suppression of bone remodeling in glucocorticoid-treated patients is unknown. Reclast was studied in male and female patients with moderate to severe Paget’s disease of bone, defined as serum alkaline phosphatase level at least twice the upper limit of the age-specific normal reference range at the time of study entry. Diagnosis was confirmed by radiographic evidence. The efficacy of one infusion of 5 mg Reclast vs. oral daily doses of 30 mg risedronate for 2 months was demonstrated in two identically designed 6-month randomized, double-blind trials. The mean age of patients in the two trials was 70. Ninety-three percent (93%) of patients were Caucasian. Therapeutic response was defined as either normalization of serum alkaline phosphatase (SAP) or a reduction of at least 75% from baseline in total SAP excess at the end of 6 months. SAP excess was defined as the difference between the measured level and midpoint of normal range. In both trials Reclast demonstrated a superior and more rapid therapeutic response compared with risedronate and returned more patients to normal levels of bone turnover, as evidenced by biochemical markers of formation (SAP, serum N-terminal propeptide of type I collagen [P1NP]) and resorption (serum CTx 1 [cross-linked C-telopeptides of type I collagen] and urine α-CTx). The 6-month combined data from both trials showed that 96% (169/176) of Reclast-treated patients achieved a therapeutic response as compared with 74% (127/171) of patients treated with risedronate. Most Reclast patients achieved a therapeutic response by the Day 63 visit. In addition, at 6 months, 89% (156/176) of Reclast-treated patients achieved normalization of SAP levels, compared to 58% (99/171) of patients treated with risedronate (p<0.0001) (see Figure 2). The therapeutic response to Reclast was similar across demographic and disease-severity groups defined by gender, age, previous bisphosphonate use, and disease severity. At 6 months, the percentage of Reclast-treated patients who achieved therapeutic response was 97% and 95%, respectively, in each of the baseline disease severity subgroups (baseline SAP less than 3xULN, greater than or equal to 3xULN) compared to 75% and 74%, respectively, for the same disease severity subgroups of risedronate-treated patients. In patients who had previously received treatment with oral bisphosphonates, therapeutic response rates were 96% and 55% for Reclast and risedronate, respectively. The comparatively low risedronate response was due to the low response rate (7/23, 30%) in patients previously treated with risedronate. In patients naïve to previous treatment, a greater therapeutic response was also observed with Reclast (98%) relative to risedronate (86%). In patients with symptomatic pain at screening, therapeutic response rates were 94% and 70% for Reclast and risedronate respectively. For patients without pain at screening, therapeutic response rates were 100% and 82% for Reclast and risedronate respectively. Bone histology was evaluated in 7 patients with Paget’s disease 6 months after being treated with Reclast 5 mg. Bone biopsy results showed bone of normal quality with no evidence of impaired bone remodeling and no evidence of mineralization defect. After opening the solution, it is stable for 24 hours at 2°C–8°C (36°F-46°F). If refrigerated, allow the refrigerated solution to reach room temperature before administration. Patients should be made aware that Reclast contains the same active ingredient (zoledronic acid) found in Zometa®, and that patients being treated with Zometa should not be treated with Reclast. Reclast is contraindicated in patients with creatinine clearance less than 35 mL/min [see Contraindications (4)]. Before being given Reclast, patients should tell their doctor if they have kidney problems and what medications they are taking. Reclast should not be given if the patient is pregnant or plans to become pregnant, or if she is breast-feeding [see Warnings and Precautions (5.6)]. There have been reports of bronchoconstriction in aspirin-sensitive patients receiving bisphosphonates, including Reclast. Before being given Reclast, patients should tell their doctor if they are aspirin-sensitive. If the patient had surgery to remove some or all of the parathyroid glands in their neck, or had sections of their intestine removed, or are unable to take calcium supplements they should tell their doctor. Reclast is given as an infusion into a vein by a nurse or a doctor, and the infusion time must not be less than 15 minutes. On the day of treatment the patient should eat and drink normally, which includes drinking at least 2 glasses of fluid such as water within a few hours prior to the infusion, as directed by their doctor, before receiving Reclast. After getting Reclast it is strongly recommended patients with Paget’s disease take calcium in divided doses (for example, 2 to 4 times a day) for a total of 1500 mg calcium a day to prevent low blood calcium levels. This is especially important for the two weeks after getting Reclast [see Warnings and Precautions (5.2)]. Adequate calcium and vitamin D intake is important in patients with osteoporosis and the current recommended daily intake of calcium is 1200 mg and vitamin D is 800 international units – 1000 international units daily. All patients should be instructed on the importance of calcium and vitamin D supplementation in maintaining serum calcium levels. Patients should be aware of the most commonly associated side effects of therapy. Patients may experience one or more side effects that could include: fever, flu-like symptoms, myalgia, arthralgia, and headache. Most of these side effects occur within the first 3 days following the dose of Reclast. They usually resolve within 3 days of onset but may last for up to 7 to 14 days. Patients should consult their physician if they have questions or if these symptoms persist. The incidence of these symptoms decreased markedly with subsequent doses of Reclast. Administration of acetaminophen following Reclast administration may reduce the incidence of these symptoms. Physicians should inform their patients that there have been reports of persistent pain and/or a non-healing sore of the mouth or jaw, primarily in patients treated with bisphosphonates for other illnesses. During treatment with zoledronic acid, patients should be instructed to maintain good oral hygiene and undergo routine dental check-ups. If they experience any oral symptoms, they should immediately report them to their physician or dentist. Severe and occasionally incapacitating bone, joint, and/or muscle pain have been infrequently reported in patients taking bisphosphonates, including Reclast. Consider withholding future Reclast treatment if severe symptoms develop. Atypical femur fractures in patients on bisphosphonate therapy have been reported; patients with thigh or groin pain should be evaluated to rule out a femoral fracture. Read the Medication Guide that comes with Reclast before you start taking it and each time you get a refill. There may be new information. This Medication Guide does not take the place of talking with your doctor about your medical condition or treatment. Talk to your doctor if you have any questions about Reclast. What is the most important information I should know about Reclast? You should not receive Reclast if you are already receiving Zometa. Both Reclast and Zometa contain zoledronic acid. Your doctor may prescribe calcium and vitamin D to help prevent low calcium levels in your blood, while you take Reclast. Take calcium and vitamin D as your doctor tells you to. You should drink at least 2 glasses of fluid within a few hours before receiving Reclast to reduce the risk of kidney problems. Severe jaw bone problems may happen when you take Reclast. Your doctor should examine your mouth before you start Reclast. Your doctor may tell you to see your dentist before you start Reclast. It is important for you to practice good mouth care during treatment with Reclast. 4. Unusual thigh bone fractures. 5. Possible harm to your unborn baby. Reclast should not be used if you are pregnant. Tell your doctor right away if you are pregnant or plan to become pregnant. Reclast may harm your unborn baby. 6. Bone, joint, or muscle pain. Some people who take bisphosphonates develop severe bone, joint, or muscle pain. Treat or prevent osteoporosis in women after menopause. Reclast helps reduce the chance of having a hip or spinal fracture (break). Treat or prevent osteoporosis in either men or women who will be taking corticosteroid medicines for at least one year. It is not known how long Reclast works for the treatment and prevention of osteoporosis. You should see your doctor regularly to determine if Reclast is still right for you. Reclast is not for use in children. Who should not take Reclast? Are allergic to zoledronic acid or any of its ingredients. A list of ingredients is at the end of this leaflet. What should I tell my doctor before taking Reclast? Are pregnant, or plan to become pregnant. Reclast may harm your unborn baby. Reclast should not be used if you are pregnant. Are breastfeeding or plan to breastfeed. It is not known if Reclast passes into your milk and may harm your baby. Tell your doctor about all the medicines you take, including prescription and non-prescription medicines, vitamins, and herbal supplements. Certain medicines may affect how Reclast works. An antibiotic. Certain antibiotic medicines called aminoglycosides may increase the effect of Reclast in lowering your blood calcium for a long period of time. A diuretic or “water pill”. How will I receive Reclast? Your doctor will tell you how often you will receive Reclast. Reclast is given by infusion into your vein (intravenously). Your infusion should last at least 15 minutes. Before you receive Reclast, drink at least 2 glasses of fluid (such as water) within a few hours as directed by your doctor. You may eat before your treatment with Reclast. If you miss a dose of Reclast, call your doctor or healthcare provider to schedule your next dose. What are the possible side effects of Reclast? Reclast may cause serious side effects. Talk to your doctor about things you can do to help decrease some of these side effects that might happen with a Reclast infusion. These are not all the possible side effects of Reclast. For more information, ask your doctor or pharmacist. General information about safe and effective use of Reclast. This Medication Guide summarizes the most important information about Reclast. If you would like more information, talk with your doctor. You can ask your doctor or pharmacist for information about Reclast that is written for health professionals. For more information, go to: www.pharma.us.novartis.com or call 1-888-669-6682. What are the ingredients in Reclast? Active ingredient: zoledronic acid monohydrate. Inactive ingredients: mannitol and sodium citrate. Do not mix with calcium-containing solutions. Administer as a single intravenous solution through a separate vented infustion line.